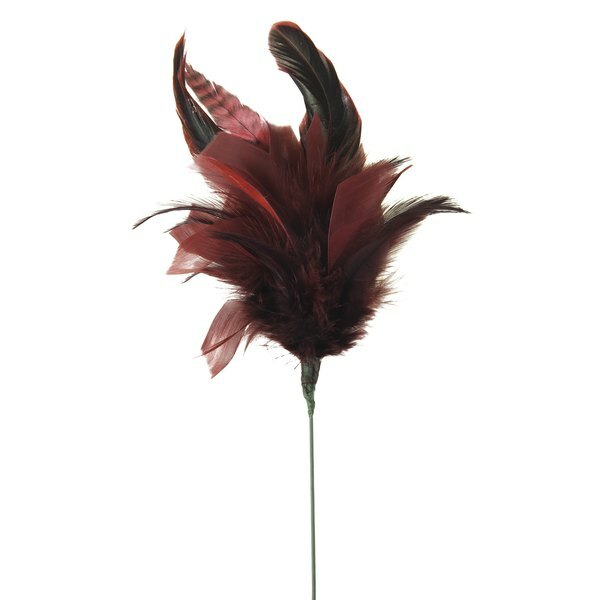 Use dyed feathers for a colorful fascinator. Fascinators are a small accent headpiece worn on the side of the head. The style can offer variety at royal weddings or other celebrations that require a head covering. The headpiece can include a number of decorative items, including a shrunken hat, faux flowers, feathers or buttons. Building a fascinator on the side of a pre-manufactured headband can guide in wear and removal. Adjust the decorations according to personal preference. Preheat the hot glue gun. Place the measuring stick on the cardboard and draw a 3-inch line in pencil. Draw two additional lines at a 45 degree angle, forming a 3-inch equilateral triangle. Carefully cut out the triangle with scissors. Work on a small area at a time, placing a drop of hot glue on the cardboard. Immediately place the feathers into the hot glue with the tips pointing toward the base of the triangle. Avoid touching the hot glue directly. Repeat this process, covering the triangle with feathers. Allow the feathers to overlap and extend off the sides of the triangle to create a visual effect of fullness and hide the stems. Place a drop of hot glue on top of the feathers, covering the tip of the triangle. Place the plastic gem on the glue. Allow the glue to cool completely for about five minutes before moving the fascinator. Add other optional decorations as desired, including buttons or faux flowers. Apply hot glue directly to 3 inches of the headband, beginning 2 inches from the bottom of one side. Center the cardboard triangle over the headband, with the bejeweled tip of the triangle pointing towards the bottom of the band. Press the triangle into the headband gently to aid the cardboard in adhering to the hot glue. Allow to cool for at least five minutes before wearing.